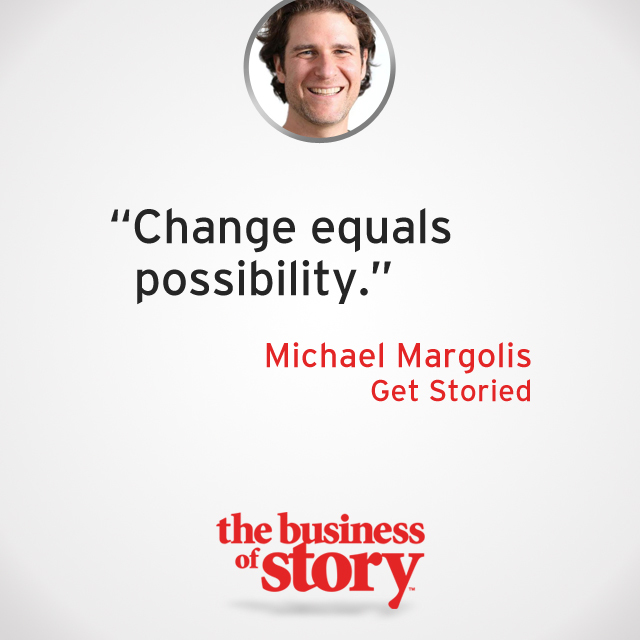 Michael Margolis is a globetrotting storyteller and a business storytelling legend. His team at Get Storied are the experts on storytelling for disruptive and social innovation. They communicate world-changing ideas and help companies humanize and distill complex technical products or solutions. Michael has created a cutting-edge, global learning community and resources to help individuals and businesses alike identify their true story and humanize their brands. How can you apply the practices and principles of narrative thinking to your next pitch? To your next newsletter? Even to your internal transformational initiatives? How can you ignite excitement in the people around you, inciting them to tap into their own potential and the limitless possibilities of our current business landscape? We go through life collecting experiences in order to have stories. If you’ve lived a life, you’ve got experiences. Everyone has a story to tell. It’s really just a matter of getting started.